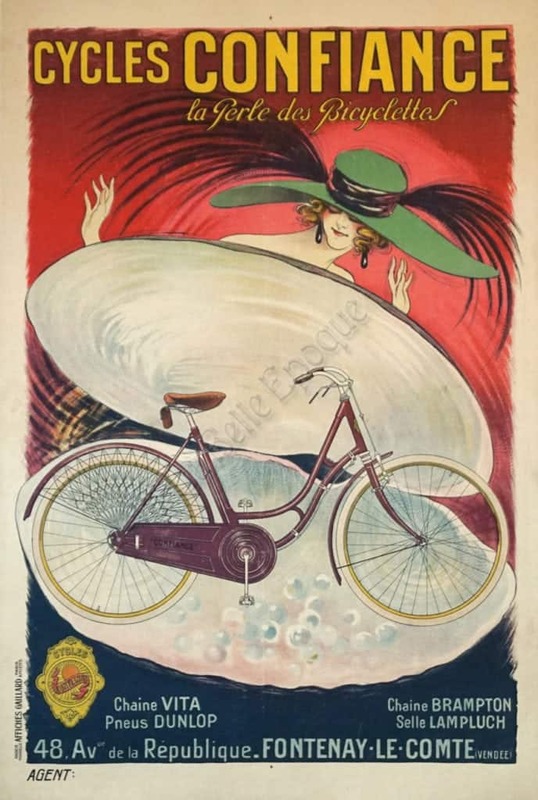 This is a spectacular and exquisitely made Art Nouveau period French poster for “Confiance Bicycles – The Pearl of Bicycles.” This vintage lithograph features an astounding and unique color scheme which complements the image of a bike, along with some pearls, in the center of a clam. A woman wearing a large green hat with plumes gazes longingly at the purple bicycle within the shell. This original poster was printed by Affiches Gaillard, Paris, Amiens. The image begins two and a quarter inches from the bottom, and one and a half inches from the top and sides.